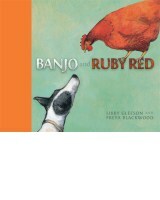 Check out all the books nominated for this year’s Children’s Book Council of Australia Book of the Year Awards at http://cbca.org.au/ShortList-2014.htm including local Freya Blackwood’s illustrations for Banjo and Ruby Red nominated for Early Childhood Book of the Year. Historical and indigenous themes are prominent in both the non-fiction and fiction shortlists recently announced with war stories reflecting interest in the anniversaries of the two world wars. Congratulations to all the nominees.